No employee loves to receive a termination letter. Employers, property owners, and other authorities don’t fancy writing them either. However, when pressed so hard by unavoidable circumstances, it might be best to dismiss someone in good faith. And albeit might be so hard to do this, it may be the best decision after all. To make the letter easy to write, you can use the following Sample Letters to send an employee home professionally or to cancel a pact in a friendly way. 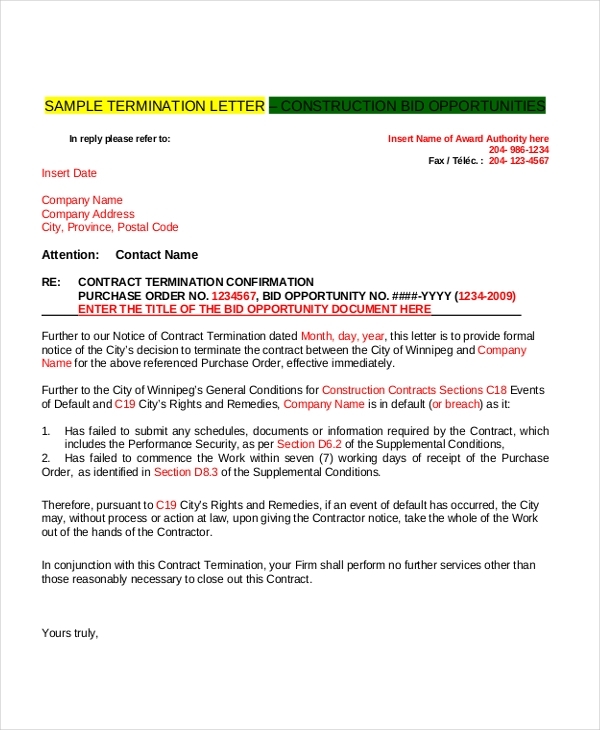 A lease termination letter is a note sent by a tenant to a property owner asking them to terminate a contract of agreement of lease with immediate effect. You can use this letter as sample reference. A treaty may come to a halt for so many reasons, and the best possible way to terminate the contract is to use this letter to call off the deal. The sample letter is free to download and use. 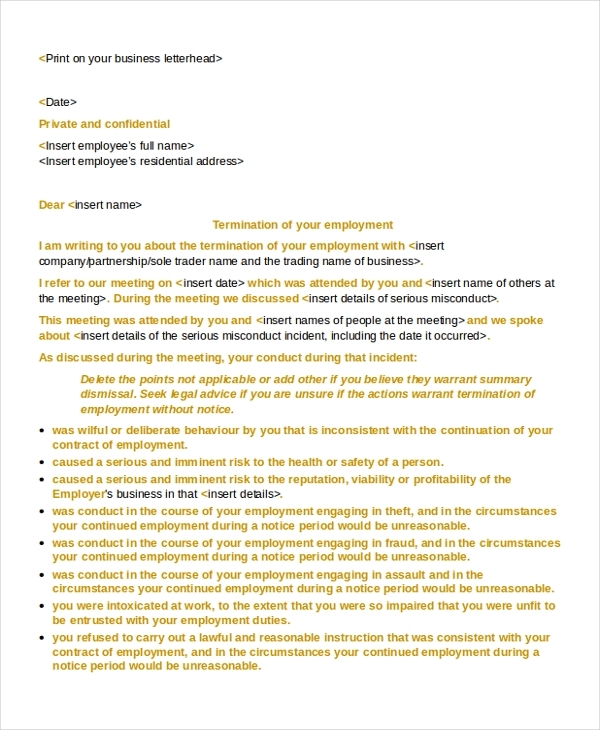 This Termination Letter or Employment is a note written to an employee informing them that their employment in a company has been terminated with immediate effect. The letter is easy to customize. 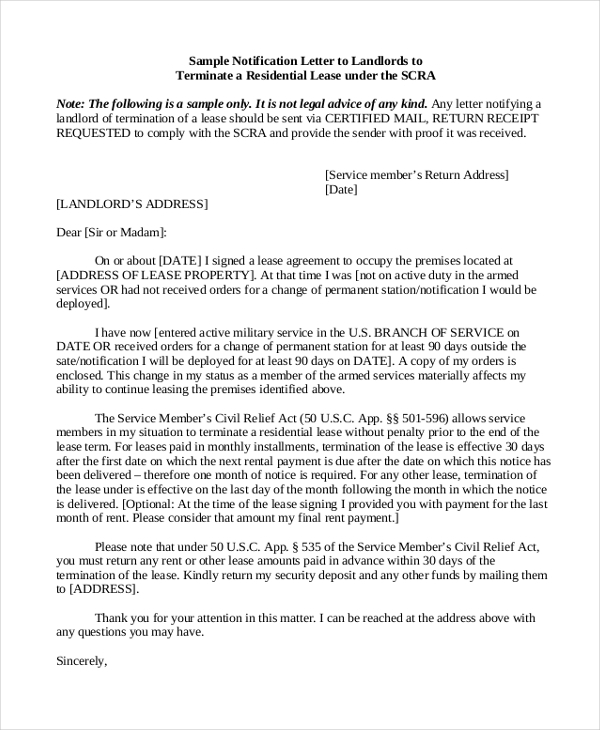 If you would like to terminate a service often offered to you by a contractor, you can use this letter to do so. The file is free to download, easy to customize, and it is written in compliance with professional letter writing standards. This is a letter written by a landlord to a tenant asking them to vacate the premises in question within the time limits given. Many terminations are often sent at the end of the month. A lease termination written by a Landlord to Tenant is an immediate notice requesting an occupant to move out of a premise as soon as the due date arrives. The file is standardized for residential and commercial lease. If you want to move out of an apartment by the end of the month, you need to inform your Landlord about it. 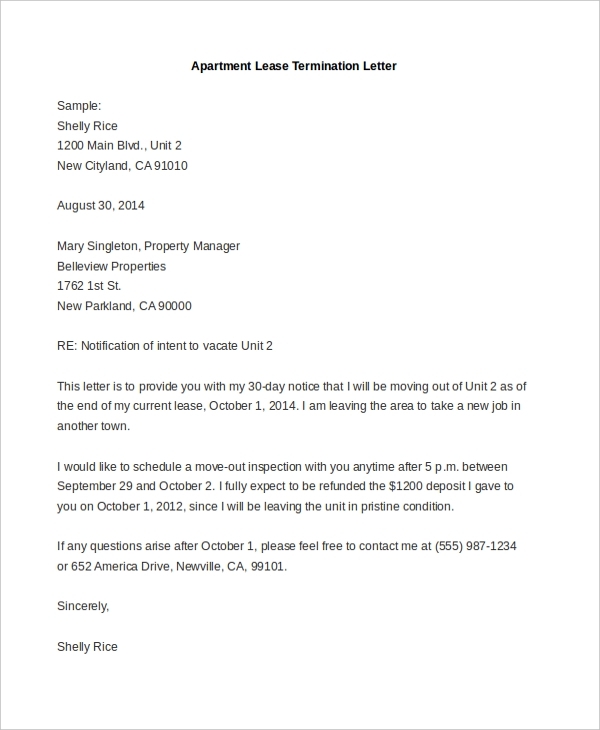 The best way to do that is to use this letter to inform them that you are calling off the contract. 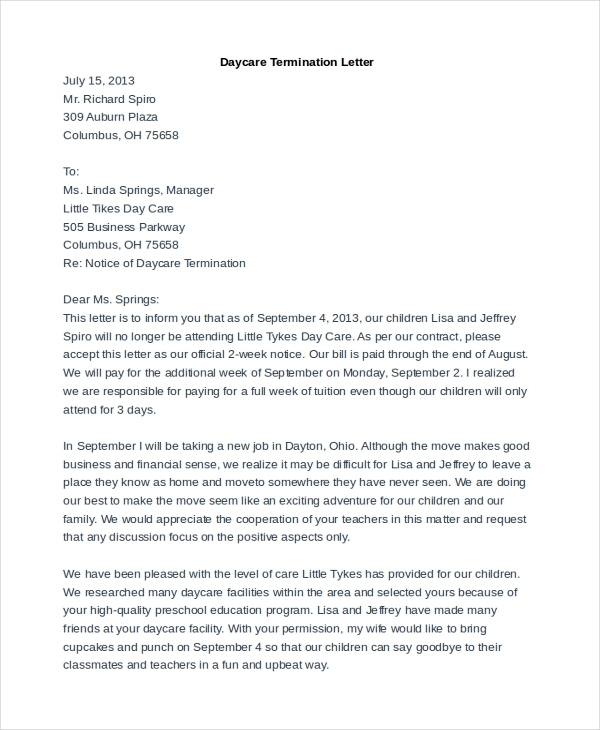 If you are a parent and you don’t want your kid in a daycare school anymore, you can send a contract termination letter to the daycare management telling them you will not be sending your child to daycare anymore. There are many reasons why terminating a contract between you and a client may be necessary. At the heart of it all, there must be a document to break the deal. Use this sample letter to do that. Making is to make an agreement with someone, and it is simpler to call off the deal, too. If you have a business relationship that’s pretty much on the edge, it may be helpful if you terminate the deal in question. 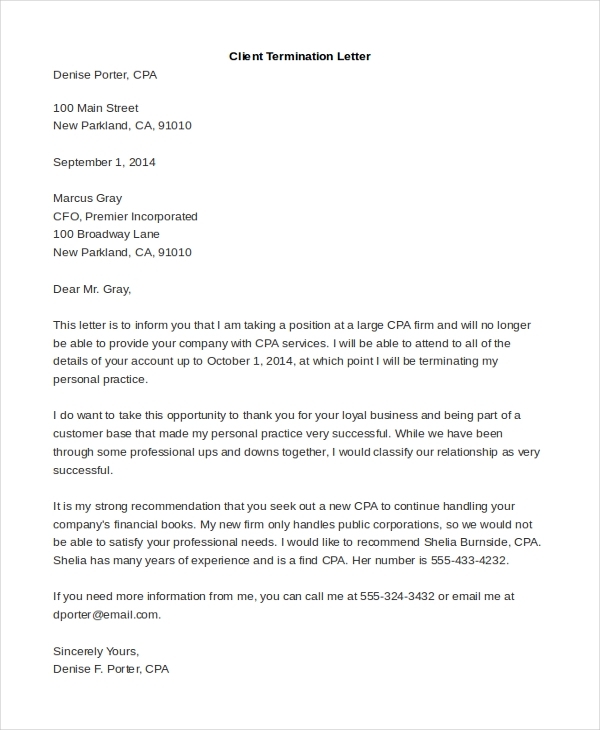 Of course, there are many instances that will trigger the writing of a termination letter by the use of sample termination letters, and they are not limited to specific people. 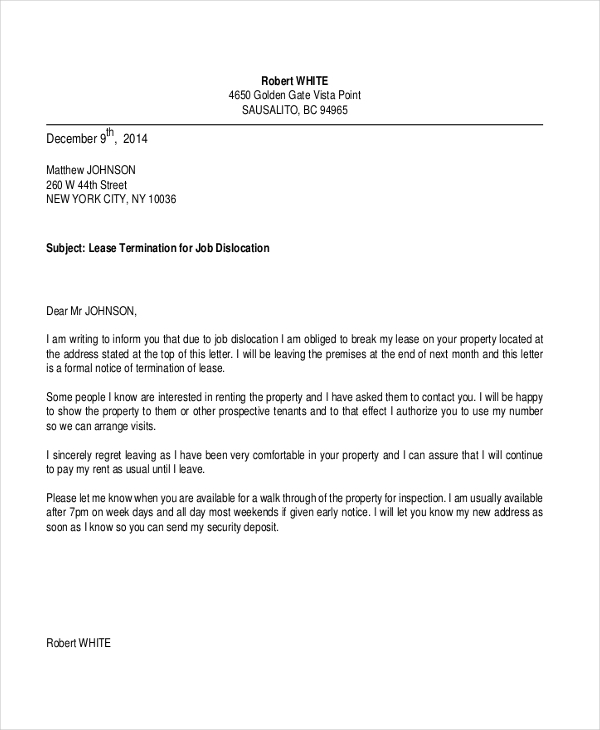 Virtually anyone can write a termination letter, for the good of themselves as well as the recipient. You can also see Sample Letter of Resignation. You are no longer interested in holding your position in your parent company. You got a well-paying job outside your parent company. You do not see any growth in your current workplace. An employer saw it worth to send you home, permanently. An employer doesn’t like you, much less value your skills. Obviously, the list is long, but you can now start to see why employers, employees, customers, and sellers often terminate business deals, even those they never expected to end. 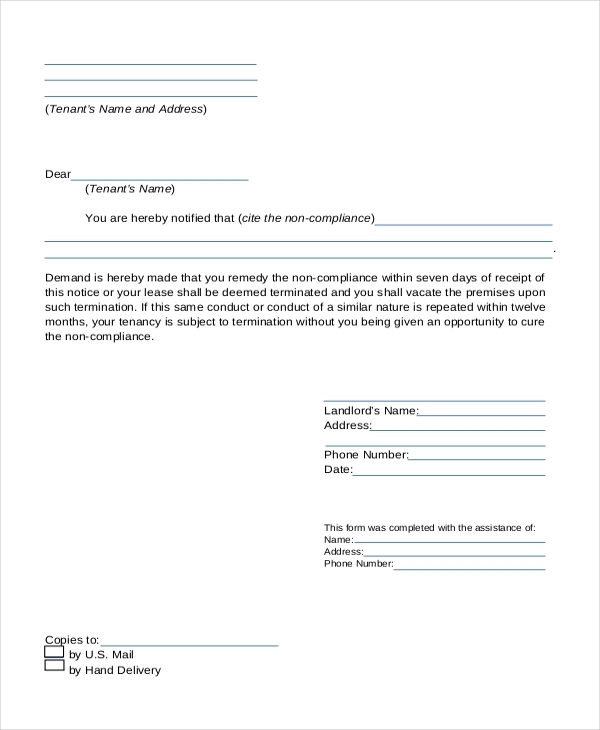 The sample termination letters are free to download, and you can use them whenever necessary. However, it is important to remember that a termination letter isn’t just something you write based on subjective perception. Your reasons for doing this must be objective and reasonable. You may also see Resignation Letter Examples.